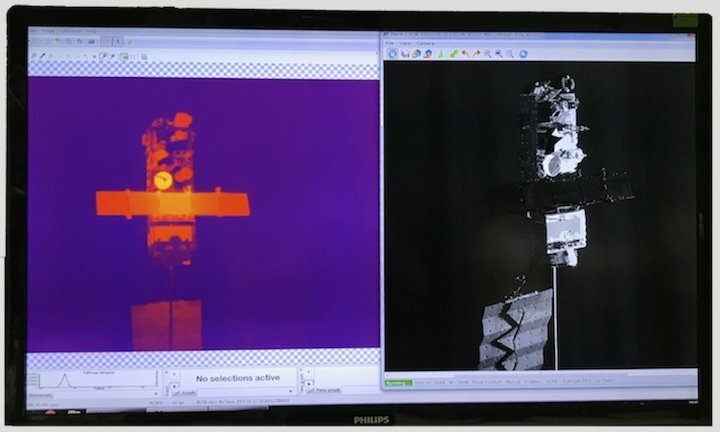 An experiment with a robotic arm observing a dead satellite demonstrated a vision-based navigation system for the European Space Agency's e.Deorbit mission, which was created to reduce space debris. ESA officials announced their decision to refocus the mission in a statement last month. According to Luisa Innocenti, head of ESA's Clean Space initiative, the agency found it would have been difficult to raise money for a single-case mission. The original goal for e.Deorbit was to remove the defunct satellite Envisat from low Earth orbit. Envisat, an 8-metric-ton (18,000 lbs.) Earth-observation spacecraft the size of a double-decker bus, failed in April 2012 after a 10-year mission. Due to its size and position in the highly populated low Earth orbit, it is now considered one of the most dangerous pieces of space debris in orbit. ESA researchers studied various technologies, including a net and a harpoon, that might have been able to catch and remove the satellite. Eventually, based on the lack of economic interest in technology aimed solely at debris removal, officials decided the agency could use the challenging mission as a trial for a much more versatile system — a multipurpose "Swiss army knife" type of satellite that could perform a whole range of in-orbit tasks, according to the statement. Before making the final decision, ESA scientists ran several studies using detailed software models of the satellite to understand how the active-orbit-removal mission could best be transformed into a highly autonomous vehicle capable of performing a variety of tasks such as moving satellites to different orbits or attaching new equipment to them. Active space-debris removal would only be one of the potential applications of the spacecraft, ESA officials said. Since such complex tasks couldn't be performed with a net and a harpoon, ESA decided to shelve the concepts and focus instead on the development of a versatile robotic arm. Innocenti told Space.com last year that the agency would spend about $10 million over the next years on developing the multipurpose robotic arm. She said the whole mission might cost around 300 million euros and would have to be approved by the ESA ministerial council, a gathering of ministers of ESA member states that will take place in late 2019. "Today we have the funding to develop relevant technologies but not to actually remove a defunct satellite," Innocenti said in the statement. "Instead, we have asked industry to make proposals to remove a defunct ESA object while demonstrating in-orbit servicing — the new path to a potentially very valuable business." She told Space.com the vehicle could first launch in 2025. Although economic support for active space-debris removal might be limited, the technology is deemed necessary by experts. The world's space agencies estimate that five large, defunct satellites need to be removed from low Earth orbit every year to help prevent the Kessler syndrome — the unstoppable cascade of orbital collisions between space-debris fragments predicted by NASA scientist Donald Kessler in the late 1970s. The issue is becoming even more pertinent with the arrival of mega constellations, which will inject potentially thousands of new satellites into the already cluttered orbital environment around the Earth.